Meera - This week, I've come along to the National Physical Laboratory in Teddington in Middlesex which specialises in the science of measurement, that's metrology, and what's interesting is that lasers play a crucial part in the science taking place here. So here to tell me more about that is Jonathan Williams, leader of the quantum and electromagnetic division. Jonathan - NPL covers a wide range of measurement for all the physical sciences. What we do is develop specialised techniques to serve a wide range of applications as you mentioned all the way through precision manufacturing, through the measurement of time, through to the measurements for healthcare so that people get the right treatment when they go in for radio therapy in hospitals for example. Meera - And how are lasers used here then and how crucial are they to this wide range of science taking place? Jonathan - The principle things for us with the laser is it's highly columnated so it travels in very straight lines and it also can be constructed to have a stable frequency or wavelength, and these are two key aspects that allow us to use metrology. The travelling in straight lines is important because it means you can use it to measure distance, you can also use it to do measurements at a distance. So for example, you can use it to scan the atmosphere and measure the amount of pollutants, say, above an oil refinery. So this is a principle like radar where of course, radar measures things like airplanes using microwaves. 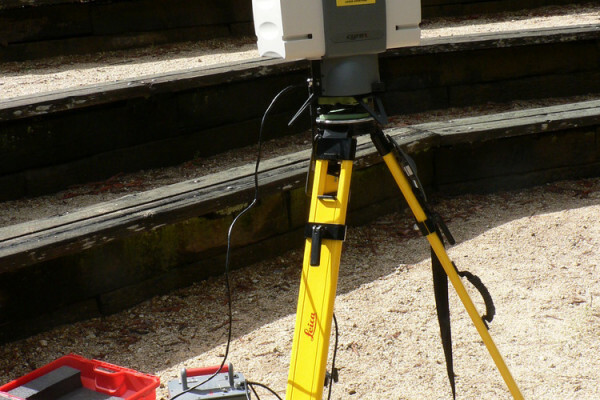 The equivalent technique with a laser is called LIDAR and it has two advantages. It can pinpoint where emissions are coming say, from hydrocarbons or sulphur dioxide, and it can tell you how much material is there, and also, exactly where it is in terms of distance and angle. We designed a specific "laser van" we call it, or a LIDAR instrument at NPL and this van drives around the world in fact, and it can then scan right across an oil refinery from within one place, and it has a very complicated suite of lasers inside that are tuned to the exact atmospheric pollutants that you're looking for. Meera - Now when describing these things, I'm imagining a constant laser beam being used in order to make all of these measurements, but you can also work with lasers in pulses as well. Jonathan - That's correct. I mean, a lot of people think of a laser as a continuously operating device that it shines all the time. But you can set them up to make very, very short pulses where short is 1 million millionth of a second, the picosecond time scale. And this has a wide range of applications in measurement too. In particular, we use these very short pulses to make short electrical pulses, very tiny impulses of electricity, and then these are used to characterise very fast electronics. Meera - And what applications does this pulse format of lasers have? Jonathan - Well the biggest application in which we all benefit from these days is in communications. A lot of communication now is done over optical fibres. Some even into the home, and these systems rely on very short laser pulses to carry the information in a very sophisticated form of Morse code. So what we do in metrology is we have to understand how well these lasers work and what their equivalent bandwidth is, and their reliability. Meera - So that's a wide range of applications of the laser here and more generally in science, but where can you see then the use of lasers being taken next? Jonathan - So the future on the science horizon is to use a laser light at very low intensity levels, so small in fact it breaks up into its smallest components, what we call photons, and the possibility there is you can then send single photons as pieces of information and you can do communication in a very secure way where you send your message as a series of one or zero photons. And this has great attraction because in theory, it's an unbreakable system. Meera - When it comes to measurements, a key application of the laser is in length measurement, and with me now, to explain more about this is Ben Hughes who is the principal research scientist in the dimensional measurements group. Ben, something that most of us are probably familiar with is we'll see the surveyor at the side of the road, holding some kind of handheld laser device or the estate agents wondering around properties, measuring the sizes of rooms. So how do these actually work and what are they actually measuring by the use of lasers? Ben - The handheld device that you've mentioned that an estate agent may be using is based on a time-of-flight measurement and it's based on the principle that distance equal speed times time, and we know the speed of light very accurately. So what we have to do is measure the time it takes for a pulse of light to travel from the device to the wall at the other end of the room, and back again. Now given that the speed of light is very high, 300 million metres per second, it means that say, a round trip to say, a wall that's a metre away will take something like 6 nanoseconds. You need some very fast electronics to be able to time that very short time. You have a measurement resolution of something like 50 millimetres, so that's the kind of precision that these devices are operating at. Meera - Now that's just one application though of measuring length. We are here in the length lab at NPL and here, you measure things on a much larger scale with a device that we've got here just in front of us which is a laser tracker which can measure things as large as aeroplanes. Ben - This laser tracker is sending out a thin pencil beam of laser light. Now you can think of that laser light as being a ruler. Now on a conventional ruler, the graduations would be perhaps in millimetre spacing. On this ruler, the graduations are spaced by exactly half the wavelength of the light. Now, on our particular laser, the wavelength is 633 nanometres, that is 0.000633 millimetres. So that means every graduation is half of that which is between 315 and 316 nanometres. Now what we can do with our laser tracker is we can use the laser beam to track a reflecting ball as we move it over our object, and the laser tracker is counting those graduations on a laser beam. So it's getting a very high accuracy measurement of where we're moving our ball. Meera - And now you have this tracking ball, which is a reflective ball, here in front of us and it's only about an inch and a half in diameter. The actual device where the laser is generated just stays still on a desk. The laser hits this ball and then stays basically on this ball, so as the ball moves around, it keeps attracting the laser to it. Ben - Yes and it has effectively a sensor inside the tracking head which can see where the ball is and can steer the laser beam to follow the ball at all times. Meera - Just in front of us, there's a metal block and so, if you wanted to accurately measure the height of this, you would just place this reflective ball at the bottom of it then on the top of it, and then you would know what that distance is. Ben - That's right. At each of those two points, I would measure the coordinates of the ball and then from the coordinates of those two points I can work out the height. Meera - So how is it applied to the aviation industry? Ben - Aircrafts requires some very tight tolerance manufacturing. What you'll see people in the aircraft industry using laser trackers for example, would be for measuring the alignment of hinge units on the trailing edge of aircraft wings. For example, hinge units for the flaps. You might find people crawling all over the wing surface, measuring the aerodynamic profile because that can be quite important especially close to the aircraft body. Meera - That's quite an interesting image, just seeing someone all over a wing, holding this very small ball to accurate measure it. Ben - It's bizarre when you sit and watch somebody doing it because they appear to be cleaning the wing whereas in fact, they're making very precise measurements. Meera - And what other industries could it be used in? What are other applications of this method? Ben - The space industry uses them, for example, for aligning components on satellites. It's very critical to get the mass distribution correct to align thrusters through the centre of mass of the spacecraft so that when they fire, it doesn't spin off into infinity, so any area where you're making big things that require very high accuracy.